Why Support National Philanthropy Day? As a National Philanthropy Day Supporter, you will show your organization’s commitment to cultivating a culture of giving in this region. You’ll receive extensive supporter recognition in front of the state’s largest gathering of individual and institutional funders, board members, community volunteers, and not-for-profit leaders. 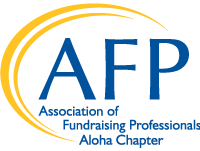 You’ll also help support AFP Hawaii Chapter’s work in promoting high ethical standards in fundraising, with proceeds dedicated to the chapter’s education, scholarship and diversity programs. As a NPD supporter, you also receive year-round benefits and are recognized as a Chapter Supporter. The following levels are maintained to thank and encourage historic and new Aloha Chapter partners who are helping us through financial support to achieve our 501(c)3 nonprofit mission. To see the full value of supporting our chapter through various levels, click here. Please consider being a sponsor to support the work of the Aloha Chapter and its NPD Luncheon and Conference. Click here for a complete list of sponsorship levels and associated benefits. If interested, fill out the sponsorship agreement. Thank you for your kind consideration and support. To learn more about sponsorship opportunities for National Philanthropy Day, please contact AFP Aloha Chapter Administrator, Susan Oshiro at 808-626-6755 or email admin@afphawaii.org. The Honolulu Star-Advertiser and the Aloha Chapter have come together to provide an official directory to highlight the countless nonprofit missions and causes that make Hawaii a special place. The Community Support Guide will showcase your nonprofit message, encourage new donor support, and volunteerism, through a one-for-one matching ad buy. Besides financial supporters, the Aloha Chapter has partner organizations and agencies that have been long term partners in communication upcoming events and deadlines of interest. The following outlines who the Aloha Chapter Partners are and the executive or volunteer that is primary point of contact to help maintain the ongoing relationship to collaboration. AFP shares education calendar with the Aloha Chapter public network. Partnering to strengthen the impact of the non-profit community on the people of Hawaii. Mahalo to our AFP Aloha Chapter donors for their support of the 2018 BE the CAUSE Campaign. Collectively, we reached our local campaign goal, raising over $5,500! A special thanks also to our board for attaining 100% participation.